Specializing in primal, joint-rocking barrelhouse, blues, boogie and early R&B, the Deep Basement Shakers are a duo with a stripped down but powerful sound. 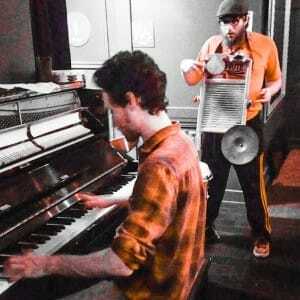 Featuring piano and an assortment of unique percussion - including washboard, spoons, hand drum, suitcase and more - the Shakers bring to life old-school, steady-rolling tunes from the deep musical traditions of places like St. Louis, Texas, Chicago and New Orleans. Sit back and groove along to some vintage American roots music designed for good times.